The Angel City Jazz Festival – LA’s only non-commercial jazz and new music festival – was founded in 2008 by music promoter Rocco Somazzi. That year the festival presented 13 acts, including Wayne Horvitz’ Sweeter Than The Day, Leni Stern, Motoko Honda, Alan Pasqua, Nels Cline & Arthur Blythe in one day on 2 stages at the Barnsdall Art Park. From 2009, Cryptogramophone’s founder Jeff Gauthier became a festival coproducer and the festival moved to the Ford Amphitheatre in Hollywood. Since then the festival has grown into an essential multi day celebration of cutting edge Jazz at some of the most exciting and prestigious venues in Hollywood and Downtown LA, like REDCAT, Zipper Hall, the Blue Whale, the Aratani Theatre and Barnsdall Art Park. The Angel City Jazz Festival consistently features the most innovative and original national and international jazz musicians working today, balancing established jazz artists with emerging talent, and focusing on west coast creative jazz, past, present and future. Brava! 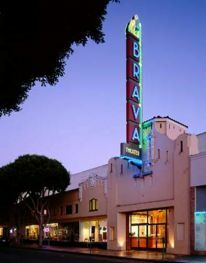 For Women in the Arts, a professional arts organization, owns and operates the historic Brava Theater Center in the Mission District of San Francisco. BRAVA’s mission is to produce, present and cultivate the artistic expression of women, people of color, youth, LGBTQ and other unheard voices. Founded in 1986, Brava! For Women in the Arts was created to give voice to the unspoken realities of women’s lives through the creation of new theatrical works. Founded in 1895 in San Francisco’s Golden Gate Park, the de Young Museum has been an integral part of the cultural fabric of the city and a cherished destination for millions of residents and visitors to the region for over 100 years. On October 15, 2005, the de Young Museum re-opened in a state-of-the-art new facility that integrates art, architecture and the natural landscape in one multi-faceted destination that will inspire audiences from around the world. The new de Young provided San Francisco with a landmark art museum to showcase the museum’s priceless collections of American art from the 17th through the 20th centuries, Textile arts, and art of Africa, Oceania, and the Americas. Headlands Center for the Arts provides an unparalleled environment for the creative process and the development of new work and ideas. Through a range of programs for artists and the public, Headlands offers opportunities for reflection, dialogue, and exchange that build understanding and appreciation for the role of art in society.